The Oakland-Craig Knights take on Fillmore Central in the first round of state playoffs. Game begins at 6:00 in Oakland. Go Knights! Photo Credit/Cindy Dahlquist. 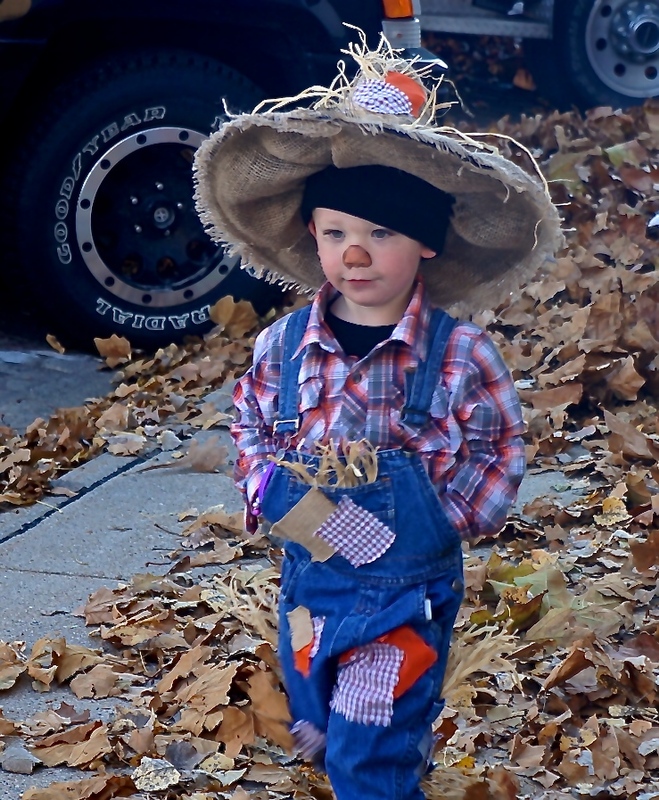 Trey Sluyter, son of Brooke Johnson and Tommy Sluyter has quite the scarecrow costume! He was one of many, many children trick or treating on Oakland’s Main Street! Photo Credit/Denise Gilliland, Editor and Chief, Kat Country Hub. Laurence “Larry” Hultquist, age 85, of Oakland, Nebraska passed away Friday, October 31, 2014, at Oakland Heights in Oakland. Services are pending with Pelan Funeral Services in Oakland. The constant theme I have heard and read in this mid-term election is that we have no leadership from either party in Washington. It is time for Nebraskans to change this. We constantly hear the statement “I vote for the person, not the party,” but rarely does that seem to happen. This election we have the opportunity to vote for an individual that has proven to be a leader. He has demonstrated this by his tireless campaign at great personal sacrifice, with nothing to be gained personally and not having an obligation to any special interests. His only goal is to represent all of Nebraska and the United States. In addition, Dave has no desire to become a career politician. In any measure of Dave Domina, his business career and his life, Dave Domina has been a proven leader. Unfortunately his accomplishments over the years benefiting citizens of the state cannot be spelled out in a short letter to the editor but he can be compared to his opponent who has been seldom seen in Western Nebraska. In fact, the Republican candidate has not shown a personal presence in at least four forums or debates across the state. Dave Domina is knowledgeable; he will listen to opposing views and most of all he sincerely cares about every citizen in Nebraska. Based on my 20 years of knowing Dave Domina, I have no doubt he can bring together enough Republicans in the Senate to understand and solve issues facing Nebraska while exercising the leadership to do what is necessary nationally. As a registered Republican, I have the opportunity to vote for the man who I feel can make an immediate difference in Washington for the benefit of our country. This kind of leadership ability is sorely short in Washington. None of the other candidates can honestly say they have this quality. Dave Domina is a man of sincerity and substance that is needed in Washington equal to anytime in the history of Nebraska and the country. We do have the opportunity in Nebraska to make a difference by voting for Dave Domina. Despite daunting data, many cases of diabetes are preventable and controllable. With the right knowledge and healthful habits, people can significantly reduce their risk. According to the Center for Disease Control and Prevention (CDC), more than26 million people in the United States currently live with diabetes. If trends continue, the condition will affect more than one-third of Americans by 2050. We invite you to attend Control Diabetes for Life on Monday November 10 to learn the latest information related to diabetes and refine your healthful habits. Yes, we have come a long way since we first began working in the field of diabetes education. We now know that the complications associated with diabetes can be prevented or delayed. Plus our growing knowledge of various foods and their effect on blood sugar levels enables people with diabetes to eat food they like, choose when and how much to eat and still control blood-sugar levels. It is the best time in history to have diabetes, especially in light of the difficulties our parents and grandparents would encounter had they been diagnosed decades ago. Today people with diabetes can choose from a wide variety of non-nutritive sweeteners and can even figure out how to fit sugar-containing foods into your meal plan. With carbohydrate information now readily available for most foods, diabetics can easily learn to count carbohydrates at each meal. This allows diabetics to fit virtually any food into your meal plan. Fitting diabetes into your life style is the key message today. Diabetes does not have to dictate how you live. If it has been a year or more since you last participated in a diabetes education session now is the time to make it a priority to updates your knowledge and skills so you can care for yourself and your family. University of Nebraska–Lincoln Extension and Franciscan Care Services invite you and your family members to participate in a new and exciting diabetes educational program. The series of programs is being offered via the two-way interactive distance education facilities. Participants will learn about current issues related to diabetes from educators with over 20 years of team-teaching experience with the in-depth Living with Diabetes series. Monday, November 10, is the third of three programs in “Control Diabetes for Life” series. Topics that will be addressed during the two-hour program are: “The Latest in Diabetes Research”; “Types of Diabetes”; “Carb Counting Refresher focusing on Combination Foods”; and “Making Peace with the Food Cops” along with other helpful hints. Participants will sample a new recipe for a diabetic appropriate food. Team-teaching the program will be Deborah Willcox, R.D. and L.M.N.T., and Stacie Petersen, B.S.N. and Certified Diabetes Educator both of Franciscan Care Services in West Point and Debra Schroeder, UNL Extension Educator in Cuming County. Participants have the opportunity to attend the program on Monday, November 10, from 7:00-9:00 p.m. at the Tekamah Herman high school distance education room. “Control Diabetes for Life” is a joint project of University of Nebraska–Lincoln Extension, Franciscan Care Services of West Point and the schools hosting the presentation. The program is offered free-of-charge. “Control Diabetes for Life” will help participants learn to control diabetes and prolong the onset of complications from the disease. These sessions are designed to supplement the education that you receive from your local diabetes health care team and not a substitute for diabetes classes through your local health care providers. Participants are asked to pre-register for “Control Your Diabetes for Life” by calling the UNL Extension Office in Burt County at 402-374-2929. Please register by Friday, November 7, so the proper number of handouts may be prepared. When registering please indicate which location and the time of that session. Nebraska School Food Service Association has approved this session for two hours of continuing education credits for food service staff for attending. Control your diabetes for life! Start by attending the November 10 distance education program. Call today to register! CRETE, Neb. – Last spring, Doane College became the first private liberal arts and sciences college in Nebraska to offer three-year programs in computer science, history and mathematics. Today, Doane announced the addition of biology, chemistry and journalism & media as new options to complete in three years, saving eligible undergraduates money on the cost of their degree and giving them an extra year of earning power through the college’s Three-Year Graduation Program. Students must apply for the three-year degree program, and eligibility and acceptance are based on high school grade point average, ACT/SAT scores and credits earned prior to enrollment. For those committed students who fit this option, faculty have created intensive academic plans with a three-year course schedule. It can save students thousands of dollars by replacing the cost of an extra year of college with an extra year of income or getting students that much closer to graduate or professional school. Degree programs have not been modified or reduced in any way. Instead, Doane has thought progressively about how students can meet requirements at a faster pace. Students will take classes in fall, spring and summer depending on the program and the number of credits students transfer. More and more high school students are taking college-level courses. According to a 2014 Advanced Placement report by CollegeBoard, more than 1 million public high school students nationwide took at least one AP exam in 2013. Doane’s Three-Year Graduation Program recognizes these students and provide them an opportunity to continue their education at an accelerated pace into college. Students with majors in mind outside of the six offered in this plan won’t necessarily miss out. Depending on courses transferred in, students may work closely with an academic advisor to create an approved plan to graduate in three years. In fact, eight Doane students have already successfully graduated in under four years without an official program in place. About Doane College – Doane is the oldest private liberal arts and sciences college in Nebraska. Doane has campuses in Crete, Grand Island, Lincoln and Omaha, and is consistently ranked among the top colleges and universities in the Midwest by Forbes.com, Money.com, The Princeton Review and U.S.News & World Report among others. Doane was named by The Chronicle of Higher Education as “A Great College to Work For” in 2013 and 2014. 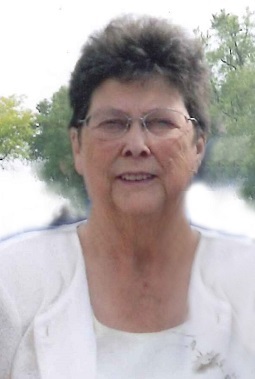 MARILYN A. SPARKS- KINNING, 79 years, of Decatur, Nebraska, passed away Tuesday, October 28, 2014, at Pender Community Hospital in Pender, Nebraska. Marilyn was born February 15, 1935, in Decatur, to Delmar and Fern (Kellogg) Stillman. She attended Decatur Public schools. Marilyn was a cook and CNA for many years. On October 27 1951, Marilyn married Robert Sparks. They had four children. Robert passed away in 1990. On August 17, 1996, she married Delmar Kinning. He passed away in 2007. Marilyn was an active member of the United Methodist Church in Decatur. She loved to crochet and play cards. She also loved going to the casino with friends and spending time with her family and friends. She will always be remembered for her famous chicken and noodles. She was preceded in death by her parents, husbands, Robert and Delmar; son, Robert “Myrna” Sparks, grandson, Cody Sparks; sisters, Naomi, Georgene, Ruby, Sharon and brothers, Kenneth, Arthur, Del Ray and Jonnie. Survivors include her daughters, Shirley Lampkin and Donnie Greve, Barb and Roger Phillips all of Decatur, Marlene Graham of Lyons, NE; daughter-in-law, Cindy Sparks of Lyons; grandchildren, Melissa and Daniel Rascon of Fremont, NE, Kellie and Jose Ramos of South Sioux City, NE, Becky Sparks of Blair, NE, Katie, Kyle and Molly Phillips of Decatur, Angela and David Whitley of Lyons, Robert Sparks Jr. of Decatur, Amanda and T.J. Beacom of Vermillion, SD, Ashley LeClaire of St. Paul, MN, Matt and Sam Graham of Clarksville, TN; 16 great grandchildren; brother, Robert Stillman of Florida; many nieces and nephews. FUNERAL SERVICE: Saturday, November 1, 2014, 10:30 a.m. at the United Methodist Church in Decatur. VISITATION: Saturday one hour prior to the service at the church. Nick Arlt led the offense again with six touchdowns, five were rushing and one was the result of an interception. Leading the way defensively with eight tackles each were Tommy Nelson, Cody Mace, Michael Fischer, Bryce Uhing, Ted Maline, Mitch Smith, Justin Smith, Joel Johnson and Conner Thiele. O-C now enters the state play off rounds, beginning with Fillmore Central Friday night at 6:00 in Oakland. “From here on out we will see nothing but really good football teams, with the playoffs going to 16 teams, this is like a 2nd round game. Fillmore central is a big physical team that starts 11 seniors, so it will definitely be a big test for us. We are looking forward to playing in front of our home crowd again,” stated Anderson. Cheer on the O-C Knights to victory on Halloween night! Cody Mallette takes on a Wisner-Pilger player on one of his six tackles for the night. Photo Credit/Cheri Droescher. 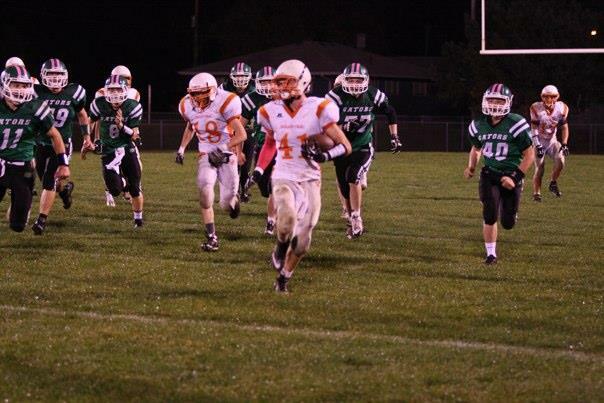 Bryce Uhing runs away from a pack of Wisner-Pilger players, with Tommy Nelson not far behind. Photo Credit/Cheri Droescher. We would like to congratulate Alicia Isner on her 5 year anniversary on being employed here at Oakland Heights. On Thursday October 30th at 2:00 pm the OC Kindergarteners will come and perform some Halloween songs, and on Friday October 31st is the residents Halloween party, we have many contest going on this week, a pumpkin decorating contest, candy jar count, and on Halloween staff and residents can dress up for Halloween and we will have a contest at the party on the residents favorites. Next week on Monday November 3rd is the monthly volunteer executive meeting at 2:30 pm, and on Thursday November 6th is a Soup and Sandwich Puttin on the Ritz Dinner for the residents at 11:30 pm. Church Service for Sunday November 2nd at 2:30 pm will be given by the Elim Lutheran Church with a luncheon served afterwards. On Wednesday November 5th at 1:00 will be communion with Pastor Hoden. Activities for the week of November 3rd to November 8th are as followed, Reading with Marilyn, Manicures, Sing A Long, Game Day, Bingo w/WOW, Bible Fellowship , Crafty cooking, Friday Bingo, Let’s Play Ball, Saturday morning movie, and Lawrence Walk. Volunteers signing in last week were; Judy Nelson, Betty Hanna, Anne Anderson, Betty Hanna, Mary Donavon, Seth Anderson, Dani Moseman, Di Ruwe, Nadine Anderson, Bonnie Fleischman, Pat Anderson, and Sylvane Rouse. Guest signing in this week was: was Janice and Caroline Rech to see Ann Gahan, Ron and Mary Plageman to see Dorothy Larson, Holly, Bowen, and Chloe Perez and Brooke, Paisley, and Hadley Peterson to see Iva Anderson. Northeast’s Cougars season came to an end with a 58-44 loss to Wynot. With as 2-6 record there will be no playoff games this season. 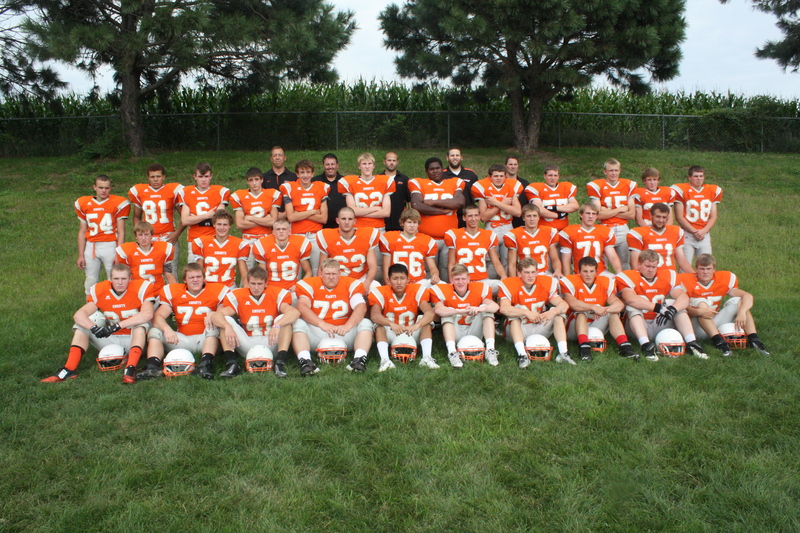 It was a tough year for the football team as they finished with just nine players suited up for the final game. They lost Marcus Hegy before the season started to a leg injury. Jon Christiansen suffered a stress fracture in the Allen game. Bren Shatto and Charles Webb missed the last game. Lyons-Decatur got off to a great start against Wynot. They took the opening kickoff and marched down the field. Chevy Henneman capped the drive with a one yard run and added the PAT to give the Cougars an 8-0 lead. The Blue Devils would control the rest of the half. They would score the next forty-six points. LDNE had trouble controlling Wynot’s Cody Stratman who rushed for 211 yards on just 11 carries. He had a73 yard TD score. “We did not play well in the first half,” said Coach Maresh. “We had a rash of penalties that were drive killers.” Northeast had 8 penalties for fifty-five yard in the game. After (6-2) Wynot scored on their initial possession of the second half, the Cougars tried to make the most of what was left of the 2014 season. LDNE scored 36 points and stopped the running clock as they pulled to within fourteen point of the Blue Devils. Dylan Hardeman broke a 50 yard run on Lyons-Decatur’s first drive. This cut the lead to 52-14. Chevy Henneman added eight points as he ran in from 30 yards out and punctuated it with a PAT. In the fourth period LDNE started with a pass-catch combo of Henneman to Montana Riecken which netted a 36 yard touchdown. This cut the lead to thirty and restored regular timing procedures. Senior quarterback Chevy Henneman would cap off his career with two more scores. He finished a drive with a five yard run. His final score would come on a 55 yard romp. With two more PATs he finished with 32 points for the night. For the two seniors on the team they went out in style with great efforts. 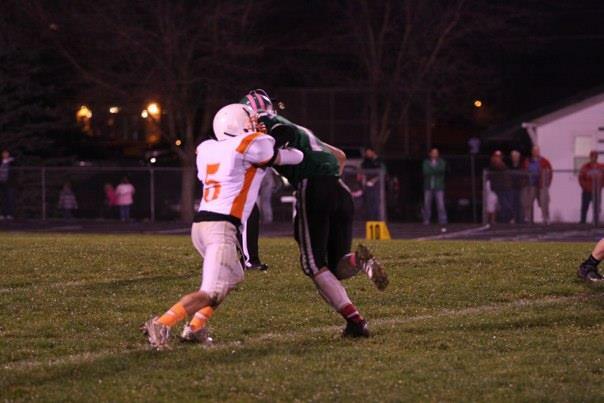 Chevy Henneman rushed for 298 yards on 32 carries. He passed for another 59 yards. Dylan Hardeman rushed for 11 yards on 17 carries. He led the defense with 10 tackles including 1 TFL. Wynot rushed for 282 yards on 39 carries with 6 scoring runs. They passed 22 times with 15 completions for 196 yards and one score. They had 478 total yards. Northeast countered with 409 rushing yards and 59 passing yards for a total of 468 yards.